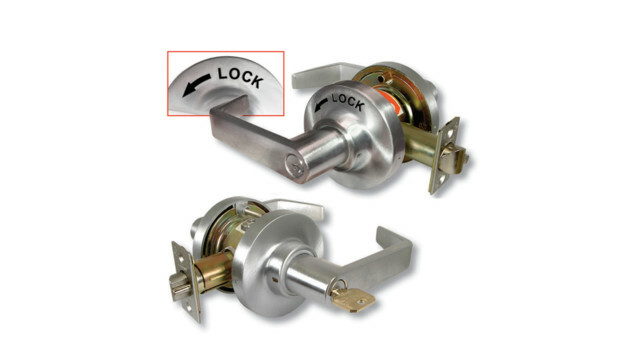 Several weeks ago, we shared a post about Choosing the Right Commercial Lock Equipment. In that post, we discussed the various types and qualities of commercial lock equipment available. However, we did not at all go into choosing the proper lever functions for your doors. Manufacturers create levers that accomplish many different goals. As locksmiths, we find this quite convenient. However, the amount of variety in how these levers work and the potentially confusing terminology involved confound many users. We receive many calls from customers who find themselves overwhelmed while trying to install levers in their businesses. Deciding what types of levers go where can drive any business owner or head of security a little bit crazy. With all of these options available, we want to provide this post to help you choose the lever functions that best suit your needs. We will start by examining how to equip doors that do not need a lock. Since many doors only need to open and close freely, installing locking levers unnecessarily could prove inefficient. From there, we will discuss some basic locking lever types for different applications. Finally, we’ll take a special look at locks that protect classrooms. While you can install classroom levers in other applications, these locks have been designed with school security in mind. Let’s begin with a look at “passage” levers, which provide the most basic of lever functions. In some cases, you may need a lever for functionality rather than security. Levers that do not require a key to operate are known as “passage” levers, as they always provide free passage. While these levers provide no security, they also provide the best price point of all the lever functions described in this post. Let’s look at your options for installing passage levers, and where you might install them. “Dummy levers” do not have a latch on the end of them. Therefore, they allow you to pull a door open with no resistance whatsoever. Many doors with dummy levers have a lever on the “pull” side of the door. The “push” side of the door may have a push plate on it rather than a lever. This allows people moving equipment to open the door with their body weight from that side. We install dummy levers on any door that should “swing” rather than latch close. Therefore, double doors in hallways make great installation locations for dummy levers. Closets with double doors also make a good landing spot for a set of dummy levers. Passage levers, such as this decorative model by Schlage, latch doors closed without allowing users to lock them at any time. Unlike dummy levers, passage levers do have a latch attached to them. This allows you to fully close a door, but does not allow you to lock it. Because doors with passage levers “click” closed, these lever do ensure that doors stay closed when needed. Office doors belonging to non-management personnel often receive passage levers. Closet doors that do not guard particularly valuable equipment also provide popular spots for a passage lever. Now that we’ve looked at a couple lever functions that do not lock, let’s examine your options for areas that do require “lock and key” protection. 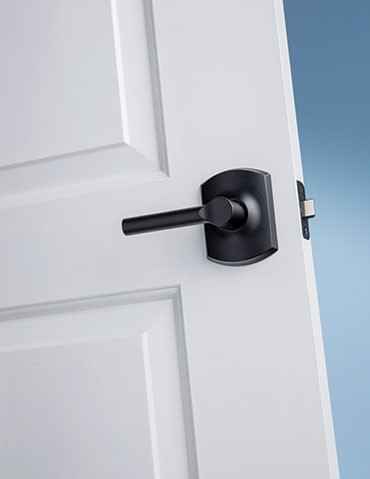 More often than not, commercial applications call for more than one type of locking lever. Exterior doors, storage doors that protect important equipment, and office doors often require some sort of lock. However, the type of lever functions utilized can still vary quite a bit from one door to the next. Let’s look at some different strategies available for installing levers on doors that require some kind of lock. When customers ask us to install a “locking lever,” they usually want an “entrance function” lever. The most basic of locking lever functions, entrance function levers allow you to lock the lever from the inside with a small turn piece on the lever. When locked, users can still use a key to operate the lever from the outside, and doing so will unlock the door until someone uses either the turn piece or a key to re-lock it. Due to fire safety regulations, users can ALWAYS operate these levers from the inside. At this point, the turn piece will generally spin into the “unlocked” position if someone had locked the door. This helps prevent users from locking themselves out of rooms. Exterior doors and secure offices that do not need to remain permanently locked make great applications for entrance function levers. Let’s look at a lever function that takes this security concept one step further. Storeroom function levers take the security of entrance function levers one step further. Like the previous function described, storeroom function levers always operate freely from the inside. However, unlike with entrance function locks, users CANNOT lock or unlock these levers from the inside. Additionally, unlocking the door from the outside only unlocks the door for one use. This means that users always need a key to operate these locks from the outside. For this reason, customers occasionally call storeroom function levers “always locked” levers. This can provide great security to doors that protect valuable offices or products that do not experience a lot of traffic. For example, little-used supply closets, doors protecting valuable inventory, and doors to the most important offices of a building often receive this type of lever. Now, we’ll look at a lever function that combines features from both entrance and storeroom functions. While not the most popular type of lock, office function levers do provide a unique set of features. These levers resemble entrance levers in that they have a keyhole on the outside and a turn piece on the inside. However, operating the lock with a key on the outside does not unlock the door for the next user. In that sense, the lever acts similarly to a storeroom function lever. Unlike with storeroom function levers, however, users can unlock the door by using the turn piece on the inside if they wish. 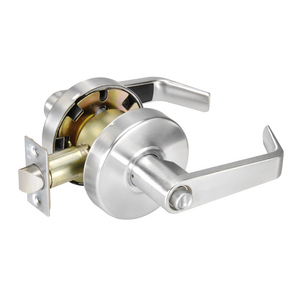 Privacy function locks, such as this Yale model, generally lock with the push of a button located on the inside of the lever. This can add convenience in certain circumstances. For example, business owners can unlock their offices during times of heavy traffic. That makes these levers useful in high-security areas that occasionally see enough traffic to leave the doors unlocked. On the flipside, this feature allows users to accidentally leave office function levers unlocked. Business owners should weigh the pros and cons of these levers to determine what function best fits their needs. Now let’s examine a unique type of locking lever that does not require a key at all. Privacy function levers allow users to lock them from one side, but do not work with a key at all. Users can lock these doors from the inside using either a turn piece or a small button on the inside of the lock. Once opened from the inside, the lever unlocks again. Additionally, a hole in the outside of the lever generally allows users to unlock the lever using a long pin or unwound paper clip. This allows workers to unlock the door from the outside in the case of an emergency. Bathroom doors make up the most popular applications for privacy function levers. At this point, we’ve looked at fairly routine lever functions for both locking and non-locking doors. Let’s wrap up by looking at a couple important types of locks aimed to securing schools. This classroom function lever by Marks cannot be locked from the inside, as depicted in the smaller picture of this lever. In our post on Why Security Professionals Oppose Classroom Door Barricades, we discussed the importance of choosing the right levers for classroom security. Indeed, protecting teachers and students in this day and age deserves special attention. 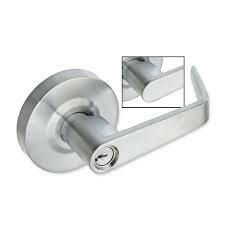 For this reason, lock manufacturers have created a couple of lever functions specifically for these applications. Depending on the age of students and specific type of application, school administrators occasionally differ as to which lever types they prefer. Let’s take a look at the two most popular type of classroom levers and discuss each. Traditional classroom levers were designed with a couple goals in mind. Just as with entrance levers, this function allows users to unlock the door from the outside with a key. However, the inside of classroom levers always operate in “passage” mode. You will see from the classroom lever pictured that the inside does not have a turn piece or keyhole. This prevents students or teachers from locking anyone out of the classroom from the inside. However, teachers can still use their keys to lock these doors from the hallway outside the classroom. This ability, combined with the near-impossibility of accidental lockouts, made classroom levers the industry standard for educational facilities at one point. However, the need for teachers to step into the hallway to lock their doors concerned many people. With this in mind, classroom levers received an update, resulting in the type of lever described below. This Marks classroom security lever features locks on both sides, as well as an indicator to help teachers know their classrooms’ locking status. In the wake of concerns about violence in schools, many districts around the country use this updated version of the classroom lock. Unlike the original classroom levers, classroom security levers do allow users to lock them from the inside. Rather than doing so with a turn piece, however, users must lock classroom doors from the inside with a key. This allows teachers to lock classroom doors without entering the hallway in the case of an emergency. As long as teachers hold on to their classroom keys, this provides a nice extra measure of security. If teachers lock their classroom doors from the inside and forget they have done so, they will need to unlock the door with their keys to render the door operable to non-key holders at that point. For this reason, many classroom security levers include a locking status indicator (pictured). This allows teachers to ensure that levers remain unlocked during the school day. We hope that this article has helped you understand some different lever functions. Knowing the terms and potential applications for these levers will help you choose the proper equipment for your own application. Choosing an insufficient lever function can lead to a lack of security in important areas. On the flipside, installing high-security lever functions where you don’t need them can also prove inefficient. Using keyed levers for doors that don’t require locks can hinder workplace convenience. Additionally, you can end up paying for security features that you do not need. If you have any questions about the material in this post, we encourage you to contact us. We provide free site surveys to businesses that need levers installed or updated. Together, we can create a combination of lever functions that provides the security and convenience that you need in your business.